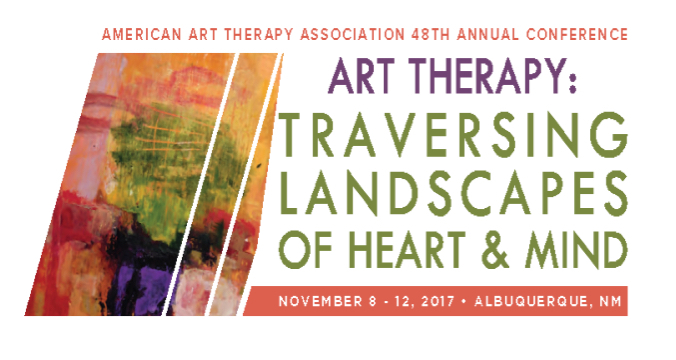 "Art Therapy: Traversing Landscapes of Heart & Mind"
The All-Texas meetup was a great chance to connect with our fellow art therapists and meet new colleagues. Carolyn Mehlomakulu at Gretchen Miller's book signing. Carolyn contributed some thoughts about her blog to Gretchen's new book about art therapy and social media. Dia de Los Muertos memorial at the conference. Prints created by Peter Buotte and a follow art therapist/veteran in the Open Studio. Prints were later gifted to veterans at an art gallery event. Sigal Govrin painting a star of hope to be sent to Sutherland Springs. Collaborative dream catcher art piece in the Open Studio - anyone was invited to add an element. Artwork by Peter Buotte - a sketch of Dr. Mihaly Csikszentmihalyi done during the keynote (and then signed by Dr. Csikszentmihalyi).